PAM, a Morhiban-based subsidiary of Even since 1998, develops a diverse range of frozen ready meals inspired by local agricultural produce and seafood in Brittany. Its products include scallops, shellfish, savoury and sweet crêpes, traditional pastries, ready meals and sauces. PAM is committed to creating added value through innovation, dedication and customer service. Its customers include well-known and respected retailers and distributors, both in France and abroad in countries such as Spain, Portugal and Belgium. Languedoc Salaisons joined Even in 1994. It is located in Pézenas, between Montpellier and Béziers, and specialises in salted meats. It boasts in-depth expertise in the drying process, as well as extensive cutting and packaging facilities. Le Saloir du Périgord joined Even in 2002. It is located in Saint-Barthélémy-de-Bussière, in northern Dordogne, and specialises in the production of dried hams. It is committed to local procurement and boasts extensive expertise in the drying process, as well as high-performance cutting lines. Its salting tubs produce more than 5,000 hams each week. Even's diversification unit combines a number of value-added food industry activities. It employs 150 people and, in 2018, generated turnover of €40 million. PAM, a Morhiban-based subsidiary of Even since 1998, designs and produces a diverse range of frozen prepared meals inspired by local agricultural produce and seafood in Brittany Its products include scallops, shellfish, savoury and sweet crêpes, traditional pastries, ready meals and sauces. PAM is committed to creating added value through innovation, dedication and customer service. Its customers include well-known and respected retailers and distributors, both in France and abroad in countries such as Spain, Portugal and Belgium. 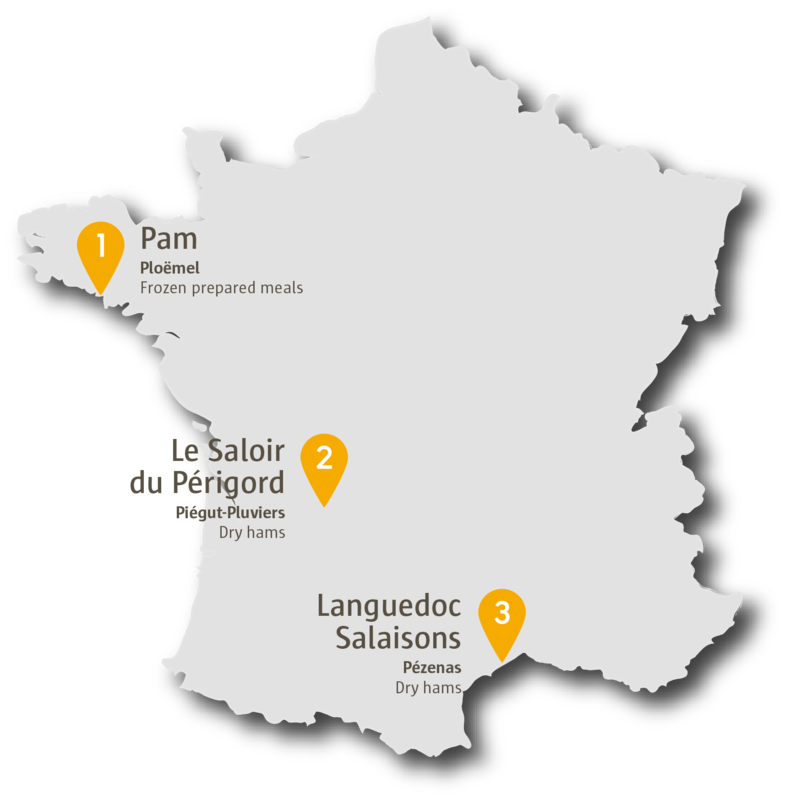 Saloir du Périgord and Languedoc Salaisons are two companies that specialise in curing and have been subsidiaries of Even for more than 10 years. Both companies boast genuine expertise in the production and cutting of cured hams, as well as the very latest equipment. They sell their various product ranges to supermarkets, catering professionals and food industry manufacturers across France.